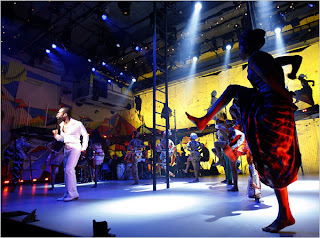 Great review of Bill T. Jones's Broadway musical "Fela!" in today's New York Times. I know that's an unexpected combination of words in a single sentence. However the critically-acclaimed show features serious music performed and arranged by key members of Brooklyn's Antibalas, and it provides a new platform to expand Fela's message and tell his story. This week the show moved to a major Broadway venue--the Eugene O’Neill Theater--following a highly successful Off-Broadway run. David McDavitt wrote a very positive review of the performance last year on this blog. Those are basic questions that “Fela!” faces when it opens on Monday. The show has moved from a widely praised Off Broadway production, last year at 37 Arts, to the larger and more mainstream realm of the Broadway musical — from 299 seats to 1,050. Amid theaters filled with more recognizable fare — movie adaptations, revivals, jukebox musicals — “Fela!” seems downright quixotic. Although the music that Fela invented, Afrobeat, and the central events of “Fela!” are familiar to Africans, in the United States Fela (as Kuti is usually called) is largely unknown except by African-music devotees and fans of political music. “Fela!” shakes up its environment, making a Broadway theater look like a club. The chronology of the show, set in 1978 but including events from the 1980s isn’t fully accurate, Mr. Jones allowed. Like Fela it prefers the mythic to the mundane and presents its story not through linear narrative but in songs, explosive dances, recollections and flashbacks loosely woven through a performance that Fela gave at the Shrine, his club in Lagos, Nigeria’s capital. It relies on the simmering beat of his music and the indefatigable dancing of an ensemble that regularly spills offstage and into the audience. In Africa, Fela, who died at 58 of complications from AIDS, is a figure to rival Bob Marley as both a musical innovator and a symbol of resistance. Afrobeat, the style he forged in the early ’70s, combined African rhythms and messages with the jazz and funk that Fela absorbed during his education in Britain and the United States. Ghanaian highlife, Nigerian Yoruba rhythms, Afro-Cuban mambos, James Brown, John Coltrane, Nina Simone and, yes, Frank Sinatra all flowed into his music, which sounds exactly like none of them. 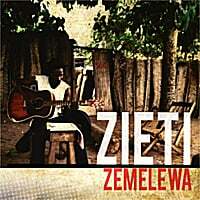 Afrobeat is insinuating but hard-headed, with stubbornness encoded in its sound and its lyrics. Its grooves are unhurried and hypnotic, with guitar, bass and drums locked into repetitive patterns while voices and horns leap freely. On Fela’s albums songs stretch 10 to 20 minutes, in long, tension-and-release forms. Each track is an excursion through verses, choruses, jagged horn-section lines, call-and-response vocals with Fela’s backup singers and dancers (who were his wives), individual solos and bruising full-band attacks. It’s music of steadfastness and endurance, of uncompromising determination. It’s also, of course, dance music, made for long nights in clubs. Within the grooves Fela’s lyrics denounce corruption and injustice, call for African values and challenge authority. Check out these cool video and music samples from the show (and dig the Halliburton reference for a reminder of how some things never seem to change). It's great to see Antibalas getting the credit they deserve for their superb musicianship and vision. The band is hosting a residency at the Knitting Factory in Brooklyn over the next few weeks for those lucky enough to get tickets to see them in their true element. PS--There will be a special performance of the show on December 10th to support Amnesty International's Global Write-a-Thon as part of worldwide Human Rights Day. Use the code FEL4AMS to receive discounted tickets for the show that day. Amnesty International's prisoner of conscience campaign in the 1970's was instrumental in freeing Fela from prison and torture in Nigeria. Thanks to Nadine Bloch for the heads up on this opportunity to do the right thing! Enjoying the Fela playlist while doing some recuperative stretching.